SUSS UK want to change this. Founded by myself and designer Abigail Grainger, we’re dedicated to educating consumers, just like ourselves, to demand more from the fast fashion retailers - more transparency, more honesty and more conscienceness - and we need your help to do this. Launching a Kickstarter campaign this month, our goal is to open a state of the art, 3-week long pop-up concept store throughout September, stocking ethical and human friendly brands from across the globe, including womenswear, menswear, kids-wear, homeware, beauty, food and drink - offering an entire lifestyle not just a fad. What makes this pop-up different, however, is what it offers beyond the shop floor. A series of talks will run throughout, with industry heavyweights giving insight into their sustainable life, whilst interactive workshops will give consumers a hands-on experience. To make this dream a reality, we need people to get on board. Read on for more insight into why this needs to happen and how we plan to do it - and if at the end you feel compelled to pledge you’ll be helping make the world that little bit better. What is SUSS UK in a nutshell? 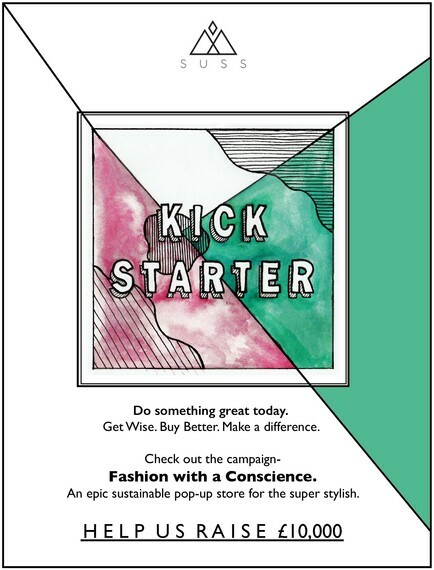 SUSS UK is a start-up that aims to help change attitudes towards consumption by providing insight into the destructive nature of the fast fashion industry, inspiring people to buy better by providing access to sustainable alternatives that remain as stylish their high street counterparts. We love fashion, but we love our planet too. How does your professional background link with establishing SUSS? Both of us have worked in the fashion industry now for a collective 20 or so years, Abi as a designer for the high street and Emma as a journalist, and so we have first hand experience of the inner workings and the very real need for change to prolong the industry that we love. What inspired you to take action and create your own start-up? Combining education and access, we’re not just a shop trying to sell yet another fashion trend, and instead focus heavily on creating inspiring and insightful talks and workshops with some of the industry’s most forward-thinking pioneers, teaching people about the devastating effects of fast fashion that are so often hidden away. Greater knowledge allows for more informed decisions and we truly believe that people are becoming more actively engaged in how they can help make a difference, no matter how small it might be. What are the main prospects and values represented by you? Raising awareness is our main driver - the more people know about the issues caused by excessive consumption, from the start of the supply chain right through to the end with how we choose to wash and dispose of our garments, the more hope we have of making a positive difference. We value honesty, transparency and the right intentions, values we instill into everything we do. What are the different industries you aim to connect? We want to offer a complete sustainable and holistic lifestyle, bringing together fashion, beauty, food and drink and even personal care, showing that with the smallest of changes we can make our every day life that little bit more conscience. But it’s not just about what we buy. We are also dedicated to providing people with little tips and tricks that they can adopt on a daily basis to help make a difference. Our Sustainable September tips series last year on Instagram saw beautiful illustrations depicting simple steps, such as taking the stairs rather than the lift or only hanging one item of clothing on each hanger so you know exactly what you own. We also celebrate people’s efforts with our #isusseditout social media campaign - where we encourage people to take a photo of themselves holding up our hashtag, post it to Instagram and tell us how they’re working towards a more sustainable life. What can we look forward to at the first pop-up event? What brands will be represented? Our first pop-up promises to provide a truly immersive offering that will enable visitors to not only support the super cool and sustainable brands we have on board in our store, but also actively participate in leading discussions about the future of the industry, the issues it causes from crop contamination to water scarcity, and hear from people that have been inspired to change their way of life in a bid to help counteract these effects. In the store, we will showcase a carefully curated selection of stylish and forward-thinking brands from the likes of Kowtow, Ono Creations, Auria Swimwear and Kind. We want to change the way people view sustainable product by presenting it in a way that is exciting, design-led and on trend, which is why we are collaborating with a top set designer to help create a concept store that is an experience in itself. What is your personal relationship with fashion? Our personal connection to fashion goes right back to university days with both of us attending UAL, where we fell in love with the creativity, energy and beauty of the fashion world. Through this relationship it became clear to us that the issue of sustainability was only growing, and reactionary action wasn’t coming quickly enough. We currently live as though the world is ours to own, but we are only tenants and we need to leave this planet how we would like to find it. Our fast fashion culture isn’t helping, and the secretive nature of the industry is only making it harder for consumers to realise the impact it has on our environment. Although sustainability is trending, why do you think there is still very little awareness about sustainable fashion? How can we make it more visible and appreciated? It’s because sustainability is trending that it’s not being taken seriously by the everyday consumer. Trends are fleeting - if people don’t connect with them or understand them they’re ignored as another one will be along in a moment. This cannot happen with sustainability. This isn’t to say, however, that we should be condemning high street brands, but instead lets draw attention to the practices they already have in place to be more sustainable, and highlight the changes they plan to make for the future. Lets be more transparent about what they do and don’t do, let’s ask more questions. At present, the consumer associates the word with design that isn’t stylish, that isn’t cool, that isn’t desirable. This isn’t true, but until the brands that combine both style and sustainability get more attention and exposure - outside of the circle they currently live in - this perception won’t be easy to shift. You can support the campaign here. This interview originally featured on Savant Magazine.